Want to take your little buddy on adventures? Then you'll need a strong, durable and, most importantly, comfortable dog backpack. This Ruffwear Approach may be the best option available. What's It Supposed To Do? Ruffwear describes the Approach as an "everyday pack" that's, "ideal for day hikes and overnight adventures." It's the second largest pack in their range, sacrificing some ultimate volume for slimmer dimensions and easier carry. At $80, the Approach is a mid-price bag. I chose it as an upgrade to Wiley's previous Outward Hound pack, after that cheaper item came out of adjustment during a short day hike, giving Wiley significant blisters, lost hair and chafing. I only ask him to carry his own water and food, so the Approach's capacity should be adequate for even our multi-day needs. How's It Supposed To Do It? Like all the packs that Ruffwear makes, the Approach sits on their Webmaster harness, a strong, padded design that securely wraps the dog's belly, armpits and breastbone. That harness includes a reassuringly strong handle and metal clip point to guide, carry or assist the dog. Unlike some of the competition, Ruffwear permanently sews the pack to the harness. 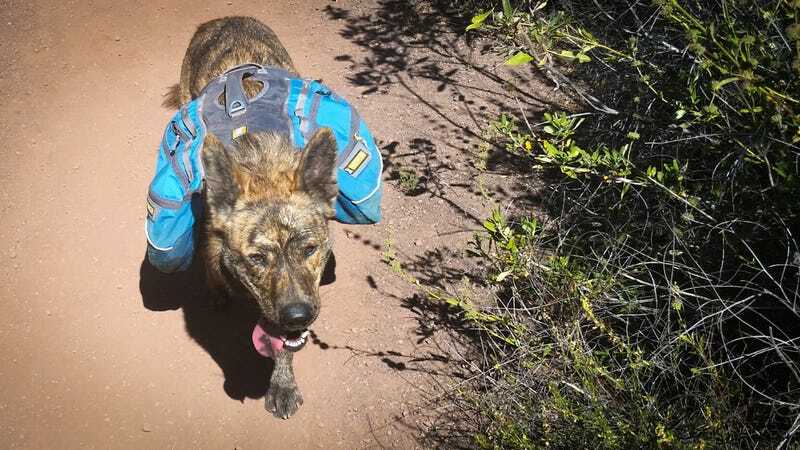 This means you can't remove the saddlebags alone or swap different packs onto a single harness, but the tradeoff is secure carry; these packs aren't tearing off even if your dog runs through dense brush at high speed. The two saddlebags each feature a large, zipped main compartment with a smaller zipped "stash" compartment up top. The forward bias of the packs — they're deeper at the front than the rear — helps carry the load over the dog's shoulders, where they're strongest. Additional gear loops stitched to the top of the pack give you the ability to clip on small items like a poop bag dispenser or night light and there's reflective piping down the side of each saddlebag. Ruffwear doesn't state what weight the ripstop nylon material is, but it feels to be approximately 500D, which is a good compromise between strength, abrasion resistance and weight. The bottom of each bag is made from an even thicker material. An important advantage Ruffwear packs have over their competition are dual adjusters for each belly strap, giving the pack the ability to lock in your adjustment and not lose its tension on the trail. Those straps are also partially padded, reducing the odds of chafing or discomfort. The Approach is available in five sizes, which should give you the ability to choose an optimal size for your dog. How Does It Perform? We've used the Approach several times on our daily, 4.5 mile hike through Hollywood's Runyon Canyon and on a single overnight backpacking trip. Total mileage to-date is around 25 or 30 miles. During that time, Wiley has experience no chafing, lost hair, or other issues. That's a big success right there. The pack has held its adjustment perfectly, not loosening at all, even after it's become stuck in narrow passes, run through dense underbrush, submerged in water and used to haul Wiley up and down boulders. The saddlebags have swallowed two one-liter water bottles, his collapsible bowl, a day's worth of kibble and a leash with room to spare. They could easily accommodate water bottles of 1.5 liters in size. The handle is made from stiff, doubled-up nylon webbing that holds it upright, making it easy to grab, even if Wiley doesn't want to be caught, and the harness is strong enough that I have total confidence in its ability to hold his 85lbs as he's lifted up and down large boulders, even occasionally supporting him during overhead lifts, where the handle provides more secure purchase than dog parts alone would. All hardwear on the Approach is of tactile quality and strength. The side-release buckles and strap adjusters are reassuringly strong and the harness doesn't feel as if it could ever break or otherwise fail to support either the pack or dog. One feature that hasn't proved useful is the leash attachment clip. Locating that so far back on the dog doesn't give you much leverage with which to steer or control him if he decides he's hell bent on going somewhere you don't want him to. Having said that, the harness doesn't obscure his collar, so it remains easy to attach the leash there, facilitating greater control. The strap that passes under his armpits also goes through a loop on the bottom of each saddlebag, keeping them from flapping around. This, plus the total stability of the harness keeps the pack aligned correctly and minimizes its movement even during high speed acrobatics, large jumps and while swimming. The Approach does not compromise the dog's stability during athletic maneuvers. It does, however (and expectedly) somewhat limit Wiley's outright performance, as any pack would. Wearing it, he's capable of fewer miles, less outright speed and can't jump as high or manage as large or steep of descents as he would without it. Wearing it, he also gets noticeably hotter and worn out sooner than he would without a pack. Perhaps a more ventilated design might limit his endurance less? One issue we are running into though is wear. At 17 months old and leading an extremely active lifestyle with daily exercise in the outdoors, Wiley is perhaps a harder test on this pack than most dogs would be, but both saddlebags are already showing signs of wear through abrasion and, in my estimation, will wear through after one or two more short backpacking trips. Just 25 or 30 miles in, the Approach is already showing signs of significant wear. This isn't a hole yet, but it will be soon. How Does It Compare To Rivals? The $80 Ruffwear Approach offers appreciably higher quality and more adjustability than any other commonly available pack on the market. The $30 Outward Hound Dog Backpack didn't last 10 miles before its bags tore off its harness, necessitating a field repair and its straps came out of adjustment during a relatively simple day hike, injuring my dog. Cesar Milan's $50 Dog Whisperer Dog Backpack also appears to be made from relatively cheap materials and appears less rugged in its design. Ruffwear also makes the larger, $130 Palisades pack and smaller, $90 Singletrak, both of which also include collapsible water bottles. All are built on the same harness system and appear to be of similar quality and materials. I've been trying to find a higher quality, more expensive, more durable solution, but am unlikely to do that in a mass-produced product. Does anyone know of any hand-made or similar low-volume, very high-quality dog backpack options out there? If so, please mention them in comments. I'd love to embark on a multi-day trip with the knowledge that I won't end up carrying Wiley's gear, no matter how many rabbits, birds and deer he decides to chase. Adventure Ready? Yes. The Ruffwear Approach provides a reasonably capacious, comfortable and secure pack at an accessible price point. It tackles issues like comfort and security with strong hardwear and construction, exceeding the quality and function of its rivals in the process. Building a pack that can stand up to the massive abuse a very active dog throws at it is a difficult task though, and not one which the Approach fully masters. For now, this pack and its counterparts in the Ruffwear catalog are the best options available, but we do hope to find (or encourage someone to make!) a more durable, totally bombproof pack in the future.